The Curious Tale of an Unexpected Visit is a side scrolling adventure game about the balance between self-affirmation and social expectations. 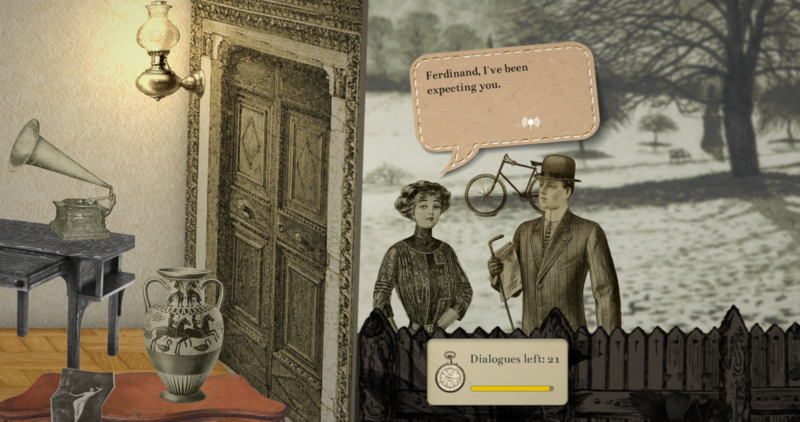 With its unique combination of Victorian steampunk collage art and a comedic absurdism inspired by theatrical farces, the game explores the dramatic potential and emotional resonance of a mundane situation. As clumsy robot Charlie, the player faces the chaotic task of cleaning up its owner’s living room minutes before an unexpected visit. Players control clumsy robot Charlie, moving around a rich collage world. Players can grab and drop objects, and rearrange the environment. The world and NPCs procedurally respond to player’s choices. About 99% of the visuals of this game are public domain images from the Internet Archive Book Images, which has over 14 million images from 2 million public domain eBooks that span over 500 years of content. Every single prop and furniture has been carefully selected among thousands of images, and put together with Photoshop to create the game’s environment. Fun fact: Both Amelia and Ferdinand characters come from a 1911 Macy’s Spring/Summer Catalog. The artist is fascinated by the idea of remixing public domain art from old books and catalogs to create something entirely new, while playing with the meaning we ascribe to objects. For this game, the visuals have inspired much of the narrative and feel, aiming to produce a fresh perspective on the original material and the context in which it first existed. This game is being made for this semester’s CTIN-532 class with Richard Lemarchand. The Curious Tale of an Unexpected Visit evolved from the idea of rituals in our day-by-day lives, and finding interesting experiences and absurdity in the mundane. It came about after a series of individual prototypes from both team members magically came together in terms of thematic and player dynamics.